German thriller in which a young police officer called Jakob (Michel Diercks) tries to uncover the truth behind recent events plaguing his small, remote village. 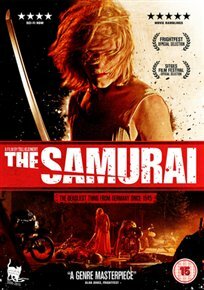 When he finally traces who he believes to be responsible, Jakob is confronted by a maniac wearing a dress and wielding a katana samurai sword, wreaking havoc on the town’s citizens for their perceived ignorance. The samurai (Pit Bukowski) tries unsuccessfully to recruit Jakob to his cause, but for some reason the young policeman also finds himself unwilling to stop him.